Copper has a living surface so it will continually lighten and darken in time creating the beautiful rich patina you see now. Reason it does this is to protect itself from chemicals, anything acidic, or any other harsh elements. This natural process is what gives copper its anti-bacterial and anti-microbial properties. If you wipe a sink down with a soft cloth you will commonly see a bit of brown/patina come off on the cloth, this is normal. In addition, if anything acidic or chemical based is allowed to sit on the sink surface, the patina will be stripped and expose the raw copper. The copper will then do what it does best and start to protect itself or re-patina itself until it eventually reaches its equilibrium and matches the rest of the sink. How do you speed up this process? The more water and oxygen come into contact with the raw spot, the faster it will patina. Copper is constantly trying to stay at its equilibrium and will absolutely not stay in its raw state. NOTE: There is no finish applied to any of Premier’s Copper Products. They are 99.6% pure copper, the other .4% are trace minerals, none of which are lead! 1) Since each sink is handmade, we do not provide a template as each sink varies slightly in size. If a template is needed, please make a template from your actual sink. Do not go off listed dimensions as there may be small variances. 2) To ensure a seamless installation, have your plumber use clear “neutral cure” silicone or our Premier Copper Products brand bronze colored “neutral cure” silicone (Model: C900- ORB) to install the drain and copper sink. Plumbers putty is white and will contrast with the copper sink and bronze drain. NOTE: Premier Copper Products offers a wide variety of matching accessories for the home. If you need a matching drain, faucet, orb installation silicone, or any other matching accessory, please contact your local dealer. When you finish using your sink, adopt the simple method of “RINSE and WIPE”. When water dries, it often leaves behind unsightly calcium stains, which may alter the appearance in an undesirable way. In addition, when food is allowed to sit on the surface of the sink, any acids within the food can alter the finish. So just remember to rinse with water and wipe with a dish towel. NOTE: Since copper is a natural anti-bacterial surface, it is not necessary to disinfect or scrub your copper, it does it for you! If you feel the surface has lost its luster, use a clear mild non-citrus liquid dish soap with a no-scratch sponge to gently scrub the entire surface. Rinse with water and wipe with a dish towel. NOTE: you may notice some brown spots on your sponge when you do this. Do not worry, it is perfectly normal. You are scrubbing off some of the patina that has built up over time. To further enhance the beauty of the finish and add an extra layer of protection from food related acids, this is a good time to use Premier Copper Surface Protectant Bees Wax Spray (Model: W900-WAX). Simply spray and wipe with a soft cloth. All cleaning products that contain abrasives, ammonia, bleach, and alcohol. All will strip the patina and expose the raw copper. 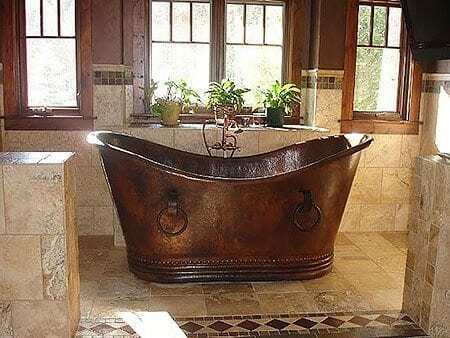 If something strips the patina, do not worry, your copper surface has a living finish. The patina will naturally regenerate with time. The best thing to do is clean the area with clear mild soap and no-scratch sponge to remove any remaining acid or chemical. Do not wax the sink until the spots have darkened back with natural patina. The more water and oxygen that come in contact with the raw spots, the faster they will patina. Waxing will slow the natural darkening process as it protects the surface from the environment. Use your sink as you normally would and you will notice the spots will darken and blend back into the sink. Here are a few simple steps to keep your Nickel Plated Copper kitchen and bath fixtures looking beautiful for years. When you finish using your sink, adopt the simple method of “RINSE and WIPE”. When water dries, it often leaves behind unsightly calcium stains, which may alter the appearance in an undesirable way. In addition, when food is allowed to sit on the surface of the sink, any acids within the food can alter the finish. Always remember to rinse with water and wipe with a soft cloth. Use water and a clear mind non-citrus liquid dish soap with a non-scratch sponge to gently clean the entire surface. Rinse with water and wipe with a soft cloth.To further enhance the beauty of the finish and add an extra layer of protection from food related acids, use Premier Copper Surface Protectant Bees Wax Spray (Model Number: W900-WAX) Simply spray and wipe with a soft cloth. All cleaning products that contain abrasives, ammonia, bleach, and alcohol. All will strip the nickel finish and can expose the copper. ALL HARSH CHEMICALS WILL DAMAGE THE NICKEL SINK! Remember this is a plated finish. It is not a solid nickel sink through and through. 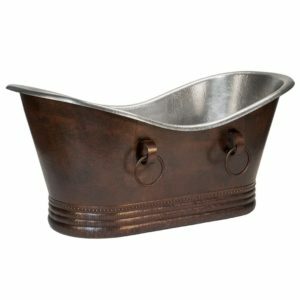 This is a Copper sink expertly plated with a Nickel finish. Any use of abrasive cleaners/sponges and chemical cleaners will result in removing the nickel finish and exposing the copper. Always remember to rinse with water and wipe with a soft cloth. Always avoid using anything abrasive that may remove the finish Following this simple routine of ‘rinse and wipe’, your nickel plated product will give you a lifetime of enjoyment! When working with acidic foods such as lemons, tomatoes, mustard, pineapple, citrus fruit, vinegar, etc., it is best to leave water running while working with products and foods of this nature and remember to thoroughly rinse your sink immediately after use. For an added layer of protection, especially in ‘hard water’ areas, consider coating your sink or tub with a high quality wax. We recommend “Premier Copper Products Surface Wax (Model Number: W900-WAX)”. This will help maintain the luster while providing better water runoff.